The Chairman of Global Counsel on the books that have changed his life and the last time he felt burned out. Peter Mandelson: Before I get out of bed I am hugged and occasionally licked awake by Jock. He is my madly affectionate border collie. Then I turn on the radio for the BBC news and the Today programme. From then on I am on the treadmill and focussed on the day. PM: Politics and political change, especially when in the government, have always given me energy. But now what I do in Global Counsel and the business world also excites me because I am at the intersection of markets, technology and public policy. PM: A good night’s sleep having prepared for the next day. PM: Apart from my own, The Third Man, the book that I recall making the deepest impression is Germinal by Zola. I read it while living and working in northern Tanzania before I went to university. I remember I was reading it when having waded through a tsetse swamp to Rwanda I hitched a ride to Kigali. PM: It goes off at 10pm and is on silent while being recharged. I check it first thing before taking a shower. I exchanged my Blackberry for an iPhone at the beginning of this year and I would never turn back. I love it. I am always looking forward to seeing who has emailed, whatsapped or Facebooked me overnight. PM: Personally, quickly and with short replies. I do not like it mounting up. PM: I phone people to stay in touch, find out how they are and exchange views. PM: I avoid burning out by pacing myself, getting good regular sleep and spending weekends in the countryside. In the mid 1980s when the Labour Party was undergoing its last near death experience I went to work as its communications and campaign director. Within six months I was anxious, sleepless and not coping. A kind doctor put me on a strict three-week regime, I recovered and learned from the experience . PM: “The victory of ideals must be organised.” – Vladimir Lenin. 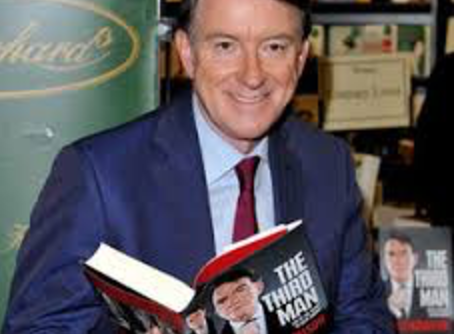 Peter Mandelson is a former European Trade Commissioner and British First Secretary of State. As Trade Commissioner between 2004 and 2008, he negotiated trade agreements with many countries and led European negotiations in the WTO Doha World Trade Round. Prior to this, he was Minister without Portfolio, Secretary of State for Trade and Industry, Northern Ireland Secretary and Secretary of State for Business, Innovation and Skills in the British government under Tony Blair and Gordon Brown between 1997 and 2010. He was Member of Parliament for Hartlepool in the UK from 1992 until 2004 and Director of Campaigns and Communications for the Labour party between 1985 and 1990. As well as Chairman of Global Counsel, Peter is Senior Adviser to Lazard and an independent director of Global Ports Holding, the world’s largest cruise ports operator. He is President of the Great Britain China Centre, a non-departmental public body which encourages dialogue and collaboration between Britain and China, and is President of the German-British Forum, the UK’s primary bilateral forum for promoting dialogue on German-British business, social and political issues. Peter is Chairman of the Design Museum in London and Chancellor of Manchester Metropolitan University. He is also President of Policy Network.